The village of Cawood sits on the southern side of the river Ouse, 1km below its confluence with the river Wharfe. The village became the site of a major river crossing on the road from Sherburn in Elmet to York and is close to the junction with the original road from Selby to Tadcaster. 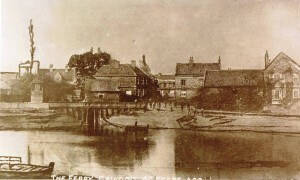 The river was originally crossed by ferry, described as a horse ferry in 1772 and was in use until 1872 a steel swing bridge, now a Grade ** listed building was built. 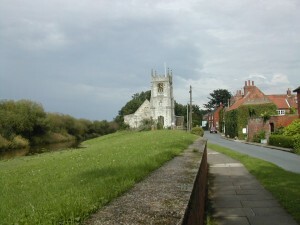 The Bishop Dike, an artificial waterway, flows into the river Ouse at this point and previously marked the south-east boundary of Cawood village. Two ditches were excavated, and although it appears that the clay pit had destroyed the majority of the site and any evidence of buildings, the considerable amount of pottery recovered confirms this as a site of occupation. The site may have been established here because of the good transport network, although the clay beds may also have been a factor. There were a very high proportion of wide mouthed bowls recovered amongst the pottery and a pottery ‘waster’ (a mis-fired piece of rim), suggesting that it was made on site, although no evidence of a kiln was found . The first reference of any detail concerning Cawood was in AD 963 when the estate at Sherburn in Elmet (including Cawood) was granted to the Archbishop of York by King Edgar to enrich the See of York. A suggestion that this was in fact a regranting of land that had once belonged to Church but had been lost during the ninth century Danish invasions. The main manor in the village was Cawood Castle, belonging to the Archbishops of York. There were no other major land holders recorded in Cawood, therefore, the manor house of the Cawoods must be Kensbury, a small rectangular moated site between Broad Lane and Wistowgate The sites of the both of the manors are Scheduled Ancient Monuments. The village appears to have been developed from three foci. 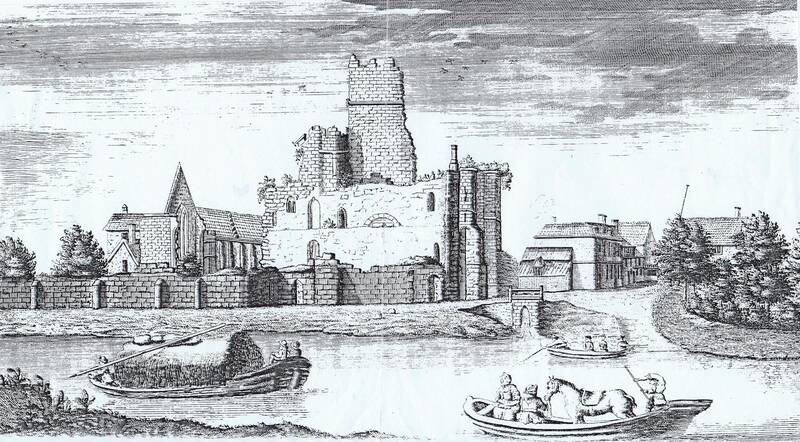 The first was the Archbishop’s Palace and the area around it. The second focussed on the area of the de Cawoode manor, whilst the third was concentrated around the Parish Church. It is suggested that these three areas may originally have been separate from each other on the grounds of topography and architecture, early maps and plans and seventeenth and eighteenth century deeds and court books. The present parish church of All Saints has a mid to late 12th century surviving west wall of the nave and doorway. At the turn of the twentieth century, the old font of early English design stood in the garden of the adjoining cottage hospital in use as a pump trough. The church was formerly a chapel of Wistow, and is set between the road and the river on a prominent rise. An early medieval chapel and graveyard are thought to have occupied this site. This implies that the settlement may always have existed around it. This area of settlement may at one time have extended to the south-west and included the current Water Row. This row of properties also has its own back lane. In between Water Row and Church End is the remains of a green, by 1851 partly used as a pinfold. 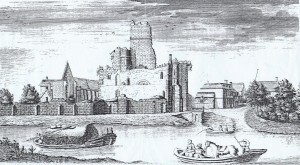 However, Water Row occupies an area of land in the northeastern corner of what would otherwise be an almost perfectly trapezoidal area of land containing the palace of the Archbishop. 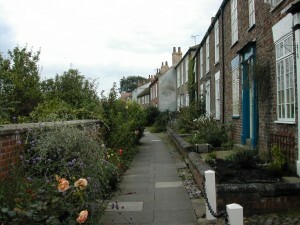 It is suggested that Water Row may have been partly or completely cut out of land belonging to the Archbishop. 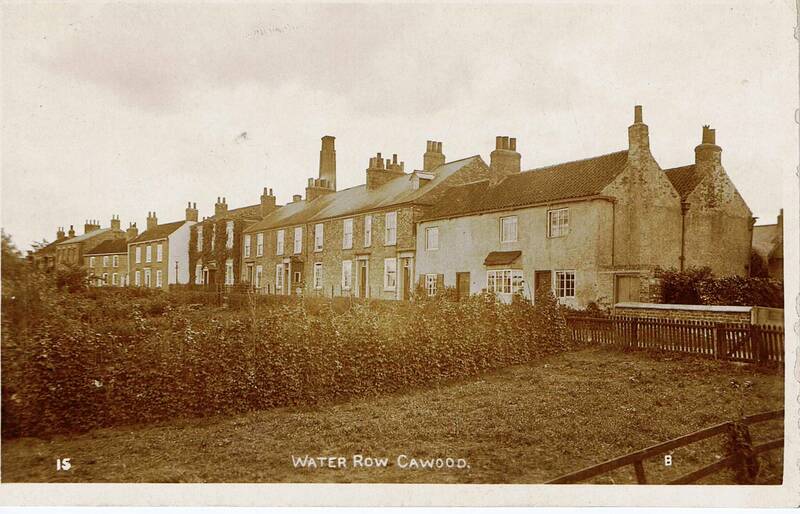 This may in turn suggest that the settlement at Water Row had a different purpose than the other parts of Cawood. The ownership of the remaining land in Church End is difficult to assess. It was probably archiepiscopal land, although this is not certain. The layout of Church End in the eighteenth century suggests that the area was planned or replanned at some point in the past.